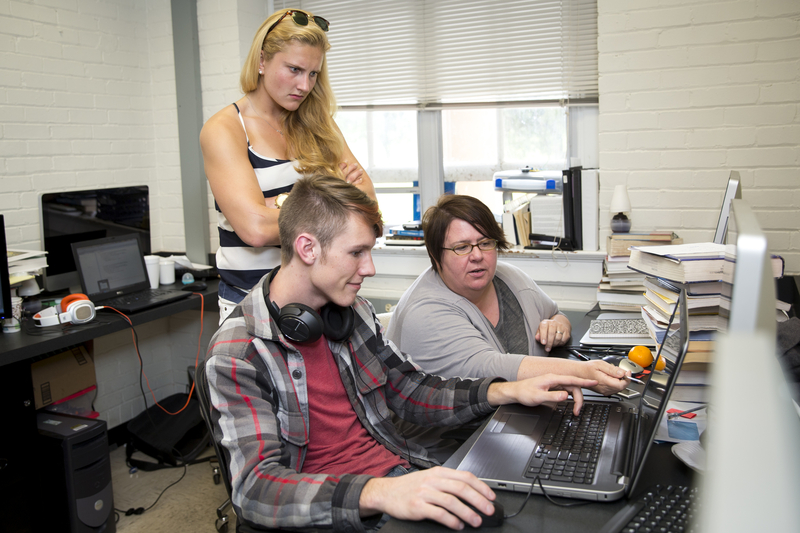 Physics Professor Katrin Schenk (right) assists Eric Huber ‘18 and Franziska Klostermyer ’15 with a programming component of their project developing an ultrasonic vocalization research system. Eric Huber ’18 and Noelle Wojciechowski ’17 are spending the summer creating efficient and affordable technology that will help Randolph researchers as well as college labs across the country collect and analyze ultrasonic vocalization data. To test the new tools they are building, the group is working with physics professor Katrin Schenk to track ultrasonic mice vocalizations. Franziska Klostermyer ’15 is also helping with the project by analyzing the data, and the group will present their work to researchers at other colleges. Schenk said the list of collaborators is a long one, and when she took Huber to a recent conference at Emory University in Georgia, Huber’s coding skills and their project drew considerable interest. “There were at least two groups of people who came up to us and asked for our help on this exact thing,” she said. A physics and philosophy double major from Cleveland, Ohio, Huber is putting those coding skills to the test during Summer Research by writing a software application that analyzes the frequency rates of the mouse calls. Part of the coding process involves Huber looking at different sample sizes and data collections and using a program called Spectrogram to track frequencies and relative intensity. He also manually adds in vocalization data the computer might have missed. “Code’s a little less terrible to work with now,” he laughed. Meanwhile, Wojciechowski is responsible for getting those sound samples to Huber. 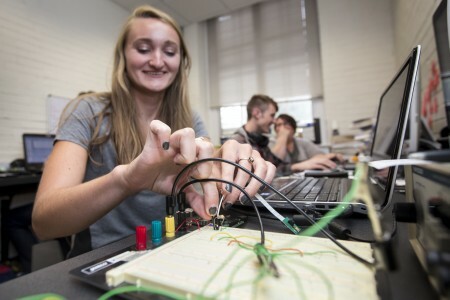 She has been building a function generator–-which she described as a big microphone for the mice ultrasound vocalization–-to send a signal through a National Instruments data collection card. She simultaneously tracks video with the audio as they monitor mouse calls. Noelle Wojciechowski ’17 develops configurations to make a sensor more user-friendly. Schenk said most mouse vocalizations are inaudible to humans. Young children can hear pitches up to 20 kilohertz, but hearing range only decreases with age. Meanwhile, mouse vocalizations can be as high as 200 kilohertz. She said the higher the frequency, the more sample rates are required to track the mouse calls. Schenk said she was impressed with how her students have handled the work and with the progress they have made so far. “I feel like I’m at the crux of my project right now,” Wojciechowski said. “I’m just trying to find the best way to make things work.